You can build muscle mass easily if you consistently do a few things, and you do them correctly. Below you’ll find 10 of these things, 10 muscle building diet tips to help you during your “transformation”. Follow every single one to maximize your muscle gain. In terms of muscle building, plant proteins are not even close to animal proteins. To run optimally, your body doesn’t need any other liquid than water. Simple sugars like milk, fruits, shakes, eaten post-workout can speed up your muscle building process. You should get about 1.5g protein per pound of bodyweight every day to build solid muscles. You should eat healthy fats, like avocados, olives, fish (salmon, tuna, herring, sardines), peanut butter, to improve your own steroid production. Eat fibrous vegetables like broccoli, cabbage, cauliflower, cucumber, lettuce or any other salad greens to help your intestines to easily absorb nutrients. If you want to lose everything you’ve built so far, drink alcohol. It will block your body’s capability to build muscle and it will increase fat storage. To ensure you have always a healthy snack around, cook your meals upfront for at least 3 days. Consume raw nuts on a daily basis to get solid proteins and healthy fats, both necessary in the muscle building process. To get the nutrients your body needs without the fat-storing sugars, you should eat more vegetables instead of fruits. 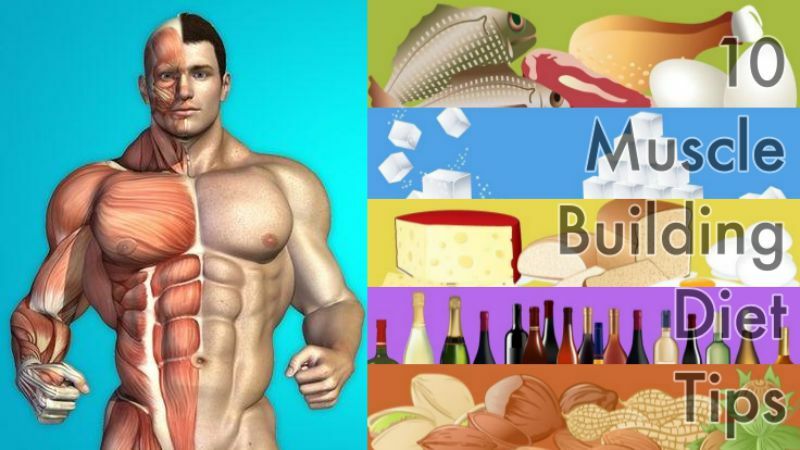 These muscle building diet tips alone are not enough to get the body you’ve always dreamed of. But implementing these 10 tips in your daily diet, and adding a great workout program to your daily schedule, can really catapult your muscle building process.